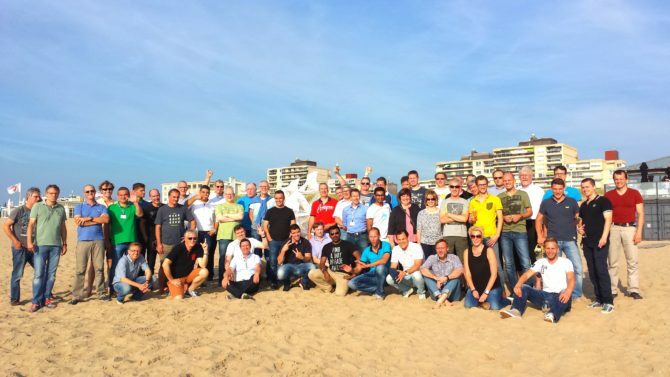 What an amazing, sunny day with megakite building in Noordwijk! Today our team had the pleasure to facilitate a megavlieger workshop for a truly fun group in Noordwijk. During the workshop ‘Megakite building’ our participants showed great creativity and quick thinking. They worked efficiently while collaborating and communicating well with their teammates. For the design phase they took some insipration from the match of the European Championship playing in the background. Our team enjoyed this lovely, sunny evening with this easy-going, fun group. Their effort payed out: we saw a well-built megakite flying high…Well done!